Pad see ew is Thai for “stir-fried flat noodles”, but this is not just a different way to cook pad Thai! One of the most popular dishes for us Thai people, pad see ew is a delicious street food dish that you won’t want to miss on your next trip to Thailand! It’s Chinese Food, Cooked in Thai Style! Chinese food? 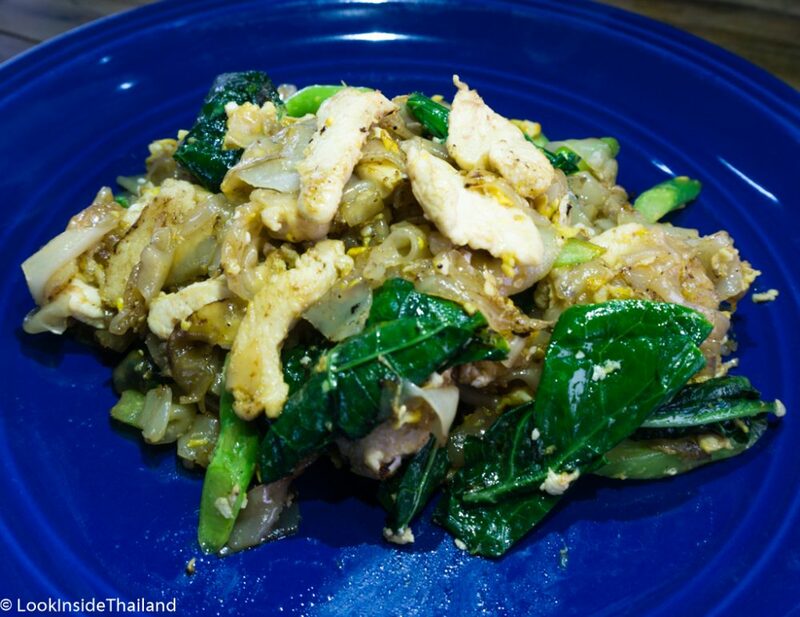 Well, Thai cooks will take ingredients that are common in Chinese dishes to make pad see ew. For example, Thai food uses fish sauce in many dishes, but soy sauce is less common. Not in pad see ew! The thick, yummy flat rice noodles are stir fried in two different soy sauces for a salty bold taste. In fact, “pad see ew” means “soy sauce noodles” in Thai. Pak kana, or Chinese kale is used as the main vegetable in this dish. What Types of Meat Can I Order? Pad see ew can come with your choice of beef, chicken, pork, or shrimp. My favorite is the chicken, but any meat or even no meat will do! No matter what, you’ll get some delicious egg-fried noodles with lots of healthy vegetables. When ordering, just make sure you remember your Thai! “Gai” is chicken, “moo” is pork, “noo-ah” is beef, and “goong” is shrimp. If you want to order it the way I like it, say “ow pad see ew gai”. This translates to “want pad see ew chicken”. There are a lot of noodle dishes in Thailand, but what’s really different about pad see ew is the way it’s cooked. Unlike in pad Thai, all the ingredients are not piled up and cooked together. A great Thai cook will stir fry the noodles in some soy sauce and then add an egg, coating the noodles in egg flavor. Only then will the cooked meats and pak kana be added to the hot wok with more soy sauce some fish sauce and spices to finish the dish. Made to Order Pad See Ew! Every noodle restaurant in Thailand serves this fresh, hot, and easy-to-make dish. 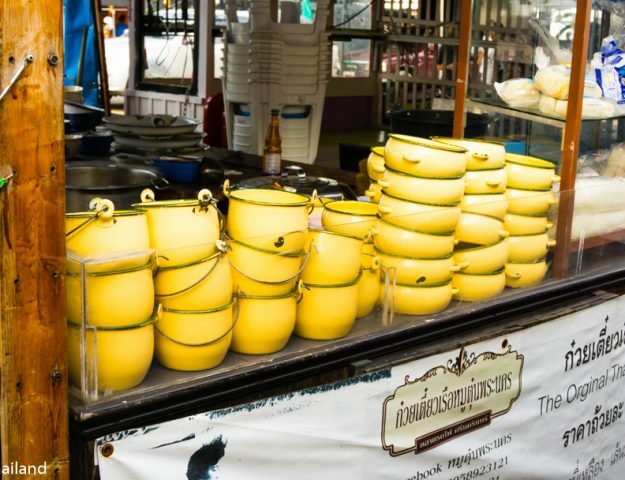 Perfect for both Thais and foreign visitors, this is an absolute must try while you’re in Thailand. By taking the best Chinese ingredients and mixing it with the Thai cooking style, this is definitely one of the national dishes of Thailand. This is unique to most dishes in Thailand because sweet, sour and spicy flavors are more common. But pad see ew is not spicy (unless you add chili flakes yourself) and the taste is mostly salty. These noodles are perfect for a quick meal or casual dining because they are mild, tasty and easy to eat. I like to eat pad see ew when I need a break from the spicy of dishes like som tam or pad krapow.